If you remember past episodes of Top Gear when the hosts consisted of May, Clarkson and Hammond, you’ll likely recall that the former was never a fan of AMG spec’d Mercedes-Benz products. He called them “stupidly overpriced” along with being brash, uncomfortable, too shouty and suggested the only people who like them are people like his co-worker Jeremy Clarkson, of whom he is openly not fond of. 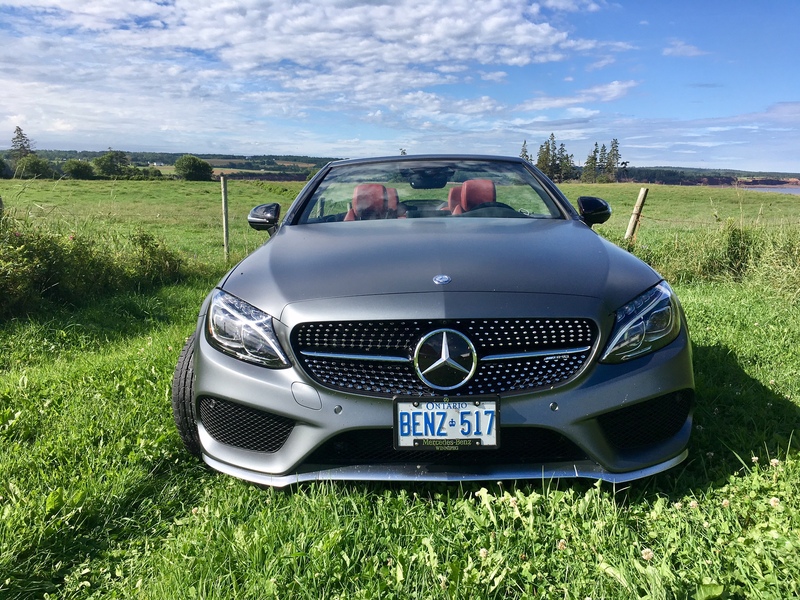 Having only had seat time behind one AMG model before this year, I could see May’s point, though admittedly, I still had fun behind the wheel of the CLS 63 AMG I got to try for about 20 minutes. 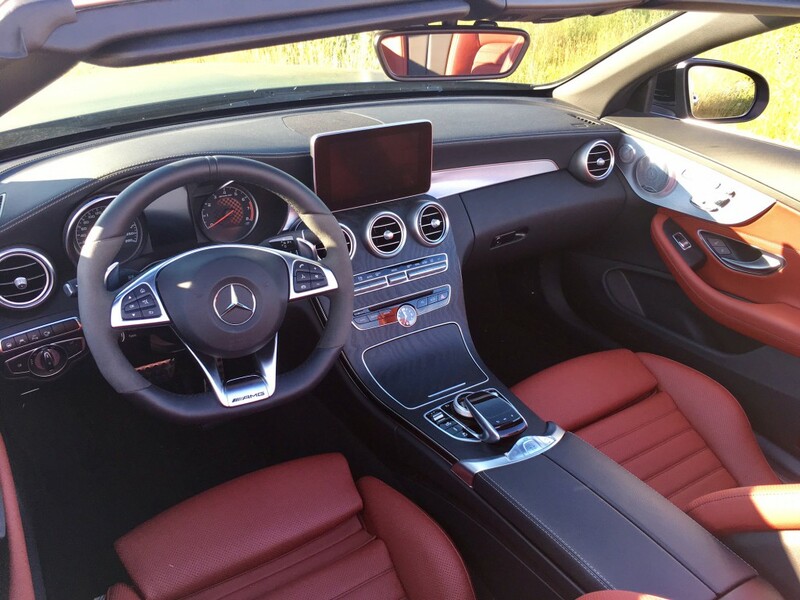 Believe it or not, it is possible for hotted up performance models in Mercedes-Benz’s lineup to be sensible. 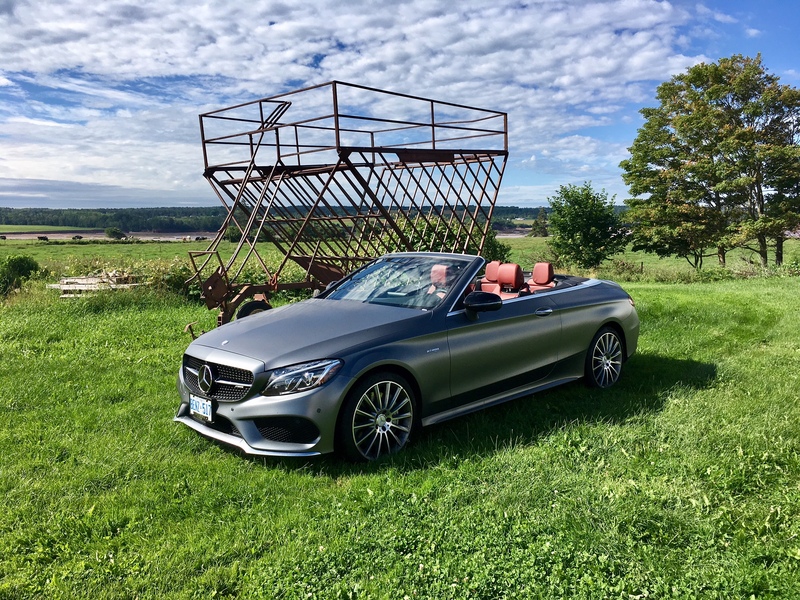 I only know that because I spent an appropriately sunny week with the C43 Cabriolet. May thinks most AMG’s look gaudy. However, AMG’s efforts to beef up the C-class’s already stunning styling are fairly restrained. Yes, the $2,500 Designo Selenite Grey paint job certainly is gorgeous and catches the eye. And no, there is no typo in that figure, there actually is supposed to be an extra zero there. The optional 19-inch multi-spoke wheels look lovely, as does the optional cranberry red leather. 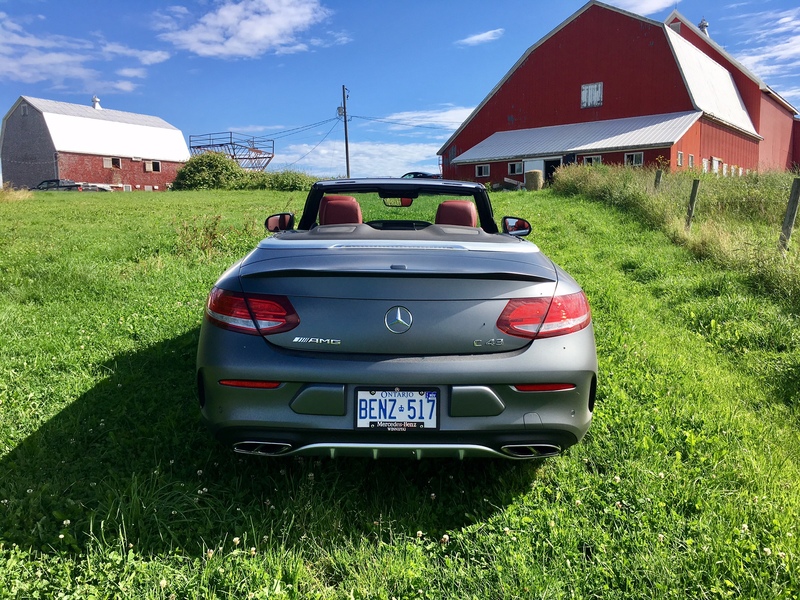 The grille sparkles in the sun and the quad exhaust let drivers behind you know this car means business. But there isn’t anything completely insane visually to let you know this is an AMG. 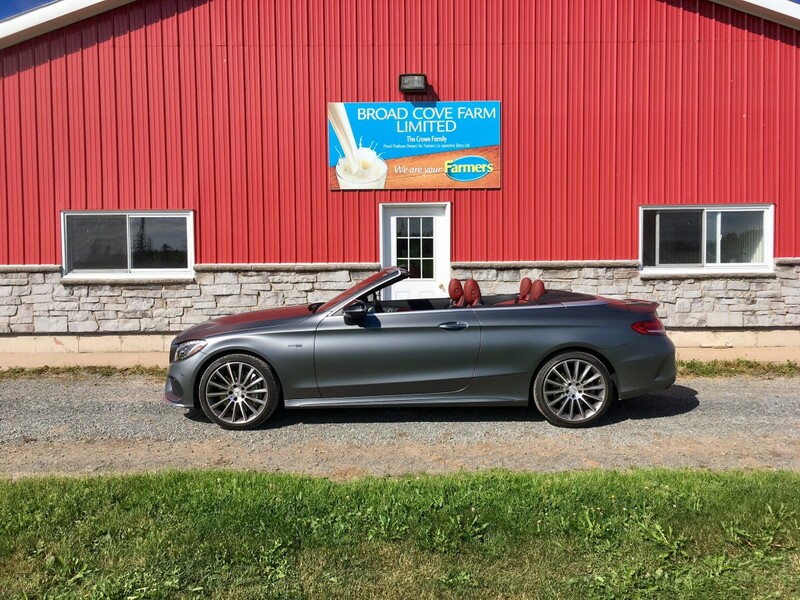 Still, the C43 doesn’t go unnoticed, especially with the top down. And it garners attention from humans of different types and tastes. A BMW M4 owner couldn’t help but take a closer look and as I chatted with him further, couldn’t help but take a few jabs at his supposed rival. Then there were the two older gentlemen; staunch domestic brand supporters, who absolutely adored it. And pretty much anyone and everyone in between. The older gentleman were particularly taken with the interior and it isn’t hard to see why. It doesn’t take a luxurious approach, rather a more sporty take with the chunky flat bottomed steering wheel which featured suede. Their eyes were also particularly drawn to the controls between the two seats where a gear shift would traditionally be. They thought the large round knob was how to put it into drive and reverse. In fact, one of the few downsides is that the gear shift is located on the right of the steering column. The stalk itself is rather flimsy. But the knob, partially covered by a touch pad operates the rather good infotainment system. It’s easy to use. The touch pad responds decently, but using it for the nav, where you have to draw each letter, is a bit time consuming. Luckily the seats offer fantastic support and are comfortable as well. 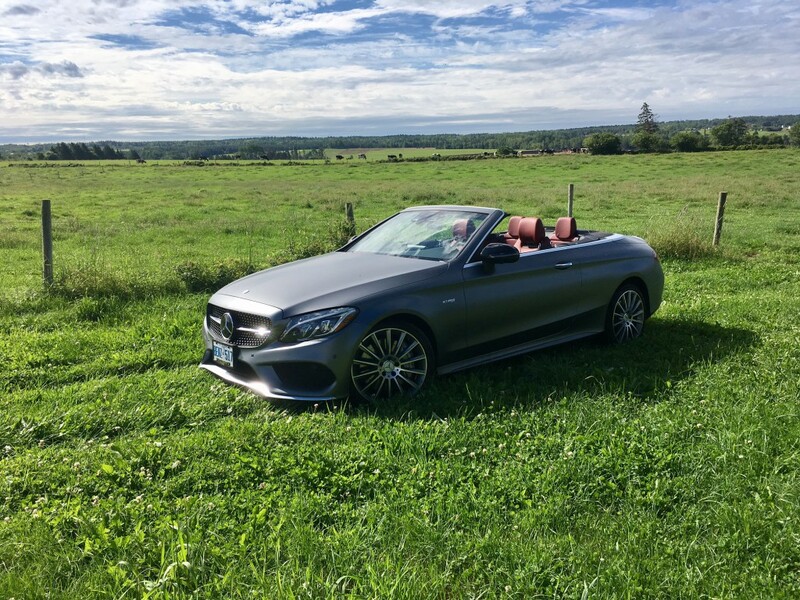 And surprisingly, the room in the back seats is adequate as opposed to being impossible to fit in human like in most cabriolet’s. I was able to fit my adored beyond belief mother who relayed she was quite comfortable. Trunk space isn’t the greatest but that is true of most convertibles. It will still fit several grocery bags with no issues. 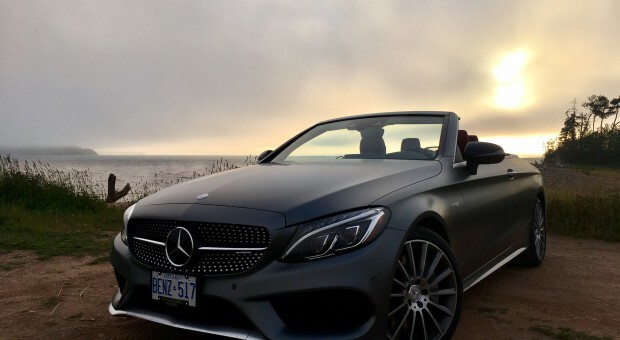 Under the hood is a 3.o litre twin turbo, or bi-turbo as Mercedes calls it, V6 which offers 362 horsepower and 384 pound feet of torque mated to a nine-speed automatic. The end result is a car with enough power for just about anyone. How it delivers that power is entirely dependent on which driving mode you are in, and there are five to choose from: eco, comfort, sport, sport+ and individual. It also rather largely depends on your driving style in each mode. 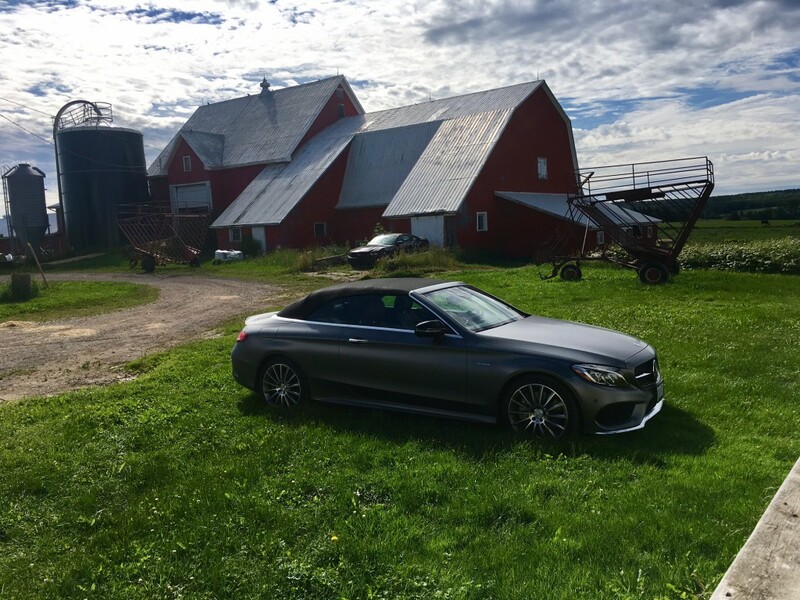 In the less aggressive driving modes, driven less aggressively at lower speeds, the C43 is comfortable but the transmission is a bit unsure of itself. It hesitates and shifts can be abrupt. Get the juices flowing and you’ll find it wakes the transmission up. In sport or sport+, you’ll find yourself worried that you may get a speeding ticket. Torque and power become quickly available and suddenly the transmission isn’t as dim witted. 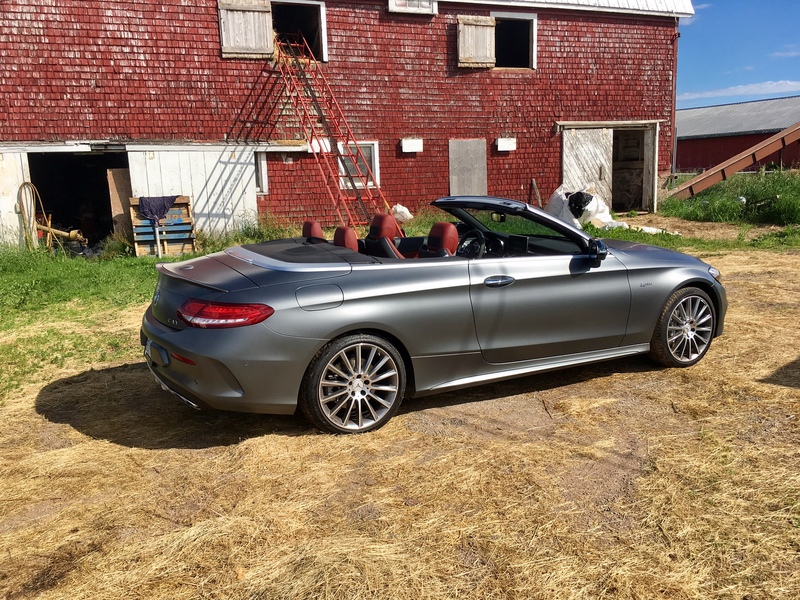 With the top down, it the exhaust note is intoxicating. But not in the “a couple of us had a few drinks and enjoyed some laughs under the stars” intoxicated. Rather, it’s more like the “black-out drunk let’s smash everything with loud music playing in the background” intoxicating. Seriously, it’s been a very long time since I’ve driven a vehicle that produced such noise. But don’t misunderstand my intoxication analogy. You’ll want to hear every last bit of the exhaust note, especially when you shift gears manually. Not only are shifts blisteringly quick, but the pop sound made, makes you wonder if flames are actually coming out of the back. Back off the throttle and you’ll hear some wonderful crackle noises on the overrun. It got to the point where I started to feel bad driving late at night or early in the morning for fear of waking up the neighbours. But you just can’t stop yourself from taking advantage of the power and the orchestra that comes out of the back. Happily, the suspension set up allows for plenty of surefooted corner carving to boot. I always enjoy the hour-long trip to my girlfriends farm, but I went out of my way to take that drive more than I actually had to. 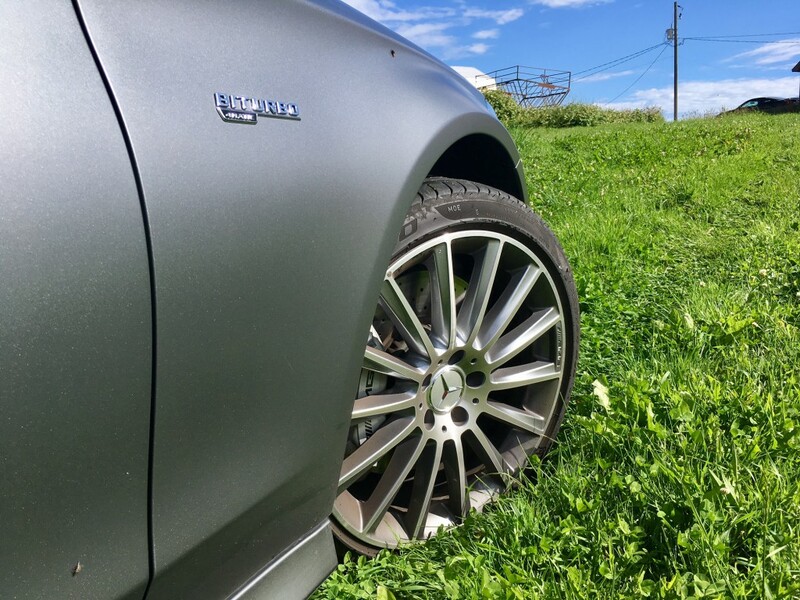 However, if you are not in sport or sport+, the C43 has a bit of wobbliness in the corner. It’s not an unmanageable amount, just more than expected for a vehicle of this calibre. But no worries, that can be adjusted in the individual settings, or, if you’d like stiffer suspension on the fly, there is a button next to the infotainment knob that let’s you adjust the suspension yourself with two firmness settings. I used this feature more than I thought I would. After taking all those unnecessary trips in the back roads of rural Nova Scotia, often in sport+ mode, fuel consumption naturally took a hit. So to save some gas on the way home one time, I kept it in eco mode but manually adjusted the firmness of the suspension to its highest setting. Now I was still having some measure of fun in the corners, all while being a bit friendlier to the environment. Speaking of fuel consumption, the C43 is rated at 12.2 L/100 kms city and 9.0 highway. With a fair amount of city and highway driving in general, I managed a rather reasonable 11.2 combined. And that’s the thing. 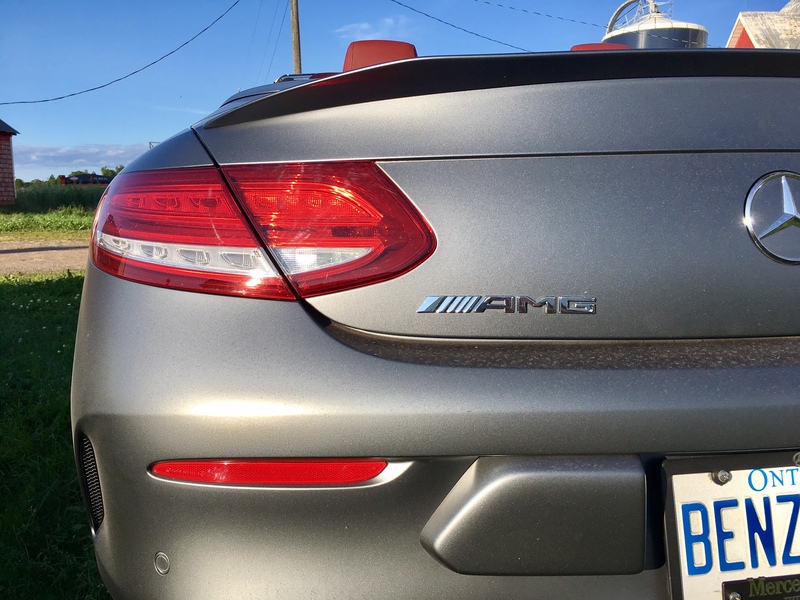 The AMG itself is rather reasonable when you think of AMG’s of the past. Yes it’s a convertible and yes it can get as shouty as a drunkard at a football game. However, it can be tamed. If you don’t get the flashy paint or wheels, it looks like a regular Mercedes. The interior is nice but not overdone. And the exhaust can get as quiet as you’d like; the suspension as comfortable as you’d like. I’d like to respectfully suggest, Mr. May, that you might find the C43 to your liking. But what of the Jeremy Clarksons of the world? There’s something for you too. There is the C63 which produces a whopping 469 horsepower and 479 pound feet of torque sourced from a V8. To me however, that isn’t even necessary having tried the C43. To me, the C43 offers the perfect blend of performance when you need it, and comfort when you don’t. And while 85 grand is a lot, this one might actually be worth every penny.